It’s fair to say that Jonathan Wilson has been a key figure in the transformation undergone by British football writing over the past decade or so. The publication in 2008 of Inverting the Pyramid, his history of tactics, foreshadowed a boom in tactical analysis, and the rise in popularity of a more cerebral approach to understanding the game can be seen in the success of The Blizzard, the quarterly football magazine Wilson founded and continues to edit.His latest book, Angels with Dirty Faces, traces the story of football in Argentina from its development and spread in the late 19th century to the present day, taking in the myriad instances of triumph, failure, glory and disgrace which have occurred along the way. Yet the book’s subtitle, ‘The Footballing History of Argentina’, reveals that the true scope of the book is even greater: Wilson is attempting to tell, at least to some degree, the history of Argentina through the lens of football.While this might have seemed over-ambitious were he writing about any other country, Argentina has seen such an inter-mingling of football and politics that it would perhaps be impossible to fully tell the story of one without the other. And, as the early sections of the book make clear, football was integral to the early myth-making of a country still trying to form an identity having only gained independence in the 19th Century. Football was first imported to Argentina, as elsewhere, by British immigrants, and Wilson gives prominence to Glaswegian schoolteacher Alexander Watson Hutton in organising structured games which led to the formation of a league in 1891 (making it the oldest football league outside Britain). Yet, with the country’s population growing rapidly through immigration from Italy and Spain, by the early 20th Century football had established itself as the game of ‘the people’ rather than a reminder of home for British expats.The strongest section of the book is the second, which covers the ‘Golden Age’ of Argentinian football from 1930-1958. Wilson brings to life a time in which ‘la nuestra’ (‘our way’, a uniquely Argentinian version of the game which focuses on individual skill and self-expression) flourished and fans flocked to see a seemingly endless chain of incredible homegrown talents. In particular, he draws attention to ‘La Maquina’ (the machine), the River Plate side of the forties whose forward quintet combined to create one of the all-time great attacking teams, and who have perhaps not received their due as a result of falling between World Cups and pre-dating televised football. Having lived in Argentina sporadically, Wilson looks to strike a balance between enthusing about the legends of the national game and remaining sceptical of any unverified stories, keenly aware that the line between fact and myth is often hazy. Tales of wonder goals from the Golden Age, relayed to the author by octogenarian ex-pros in cafes, are often followed by footnotes explaining that his subsequent research suggested they may be apocryphal. His eagerness to gain the full context of the eras of the Argentinian game is also shown with regular digressions into the history of the country’s politics, economy and culture. Parallels are often drawn between the political direction of Argentina and the fate of its football teams: for instance, the coup d'état which overthrew Juan Perón in 1955 and subsequent spiral into chaos is shown to mirror the rapid shift in dominant footballing ideologies from the freewheeling positivity of ‘la nuestra’ to a culture of cynicism, defensiveness and violence in the sixties.The story Wilson tells from that point onwards is broadly one of a conflict between those two tendencies within the Argentinian game. The World Cup triumph on home soil in 1978 is given careful treatment, as the recognition of the achievement of manager César Luis Menotti and his players is caveated with explanations of how the ruling junta may have tried to influence the tournament’s outcome, and the horrors perpetuated by the regime as thousands of citizens went missing, were imprisoned or killed.In my view, the last three sections of the book are slightly weaker than what comes before, as they focus (perhaps inevitably) heavily on the stories of Maradona and Messi. Wilson does provide some insights into how the backgrounds and personal lives of these two very different characters have impacted how they play and understand the game, and contextualises Maradona as fitting perfectly into the Argentinian archetype of a ‘pibe’ (an urchin-like figure who overcomes an impoverished background thanks to skill and cunning). Nevertheless, it is difficult not to feel that Wilson is less enthused by this material, much of which will be familiar to modern readers and some of which, such as the tactical influence of Marcelo Bielsa, the author has covered extensively elsewhere. Later chapters occasionally tend to run into lists of opponents, results and goalscorers, and the stories provided by the domestic game inevitably lose some of their sheen as we enter a time when – as Wilson acknowledges – the Argentinian league features a much lower standard of play than the top European leagues due to any decent players leaving early in their careers.Overall, though, Angels with Dirty Faces is a hugely enjoyable read – I raced through the 523 pages – and its broad scope never comes at the expense of depth. Wilson’s analysis of how Argentinian football developed is punctuated by humorous and unusual human interest stories, such as that of Imre Hirschl, the Hungarian butcher who somehow ended up leading River Plate to two league titles in the thirties, or of Aldo Pedro Poy, who keeps up an annual tradition of recreating the diving header he scored for Rosario Central in a semi-final in 1971. 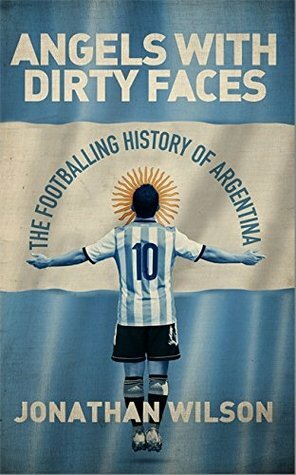 It is these stories which explain the ongoing fascination with the unique, flawed phenomenon that is Argentinian football, and it is these stories which will stay with me after reading this book. Wilson writes as well or better than anyone about how technical choices by soccer players turn into narrative, myth, and ideology. He is at his absolute best on the pausa, the creative midfielder's moment of vision before the decisive throughball; the pibe, the amoral urchin who is the archetypal Argentinian forward; and how both creative and regimented soccer philosophies became politically freighted under various national regimes. UnlikeInverting the Pyramid, which has a dialectical structure and an arc described right in its title, this history is relatively shapeless. It is still full of incident and interest, especially for readers like me, who know only the barest outline of the South American game. Inverting the Pyramid set the bar high, but with this work on Argentina Wilson has moved the bar even further. Not only does he discuss key trends and actors in the history of the sport, but he discusses how the turbulent political history of the nation has had an influence as well.A country obsessed with sport, with the specter of fascism in the background -- there are shadows and similarities to my own country today.Highly recommended for fans of the sport and sport writing in general. An impressively thorough journey through the last 100 years or so of Argentinian football. Would have liked a bit more on Batistuta and Canniggia - two former favourites of mine but still very thorough and illuminating. One of the best football books I've ever read. Also one of the best history books I've ever read. Brilliant. An absolutely fascinating journey through Argentinian history. While it might be ostensibly a book about football, what this really is is the story of Argentina -- its rise, fall and stagnation. Worth a read even if you're not a football fan but interested in South America and Argentina specifically. I vowed never to go back to football literature more than a decade ago. Back then, I enjoyed similar works to what this book is to Argentina adapted on other countries: Germany (Licthenberger with Tor! ), Italy (John Foot with Calcio) and Spain (Ball with Morbo! ).I was hence wary but tipped over the edge by the author. I read Inverting The Pyramid 4 years ago and it completely changed the way I watched football (which is pretty much the only thing I do in my free time). Obviously, I decided to give it a go.The book depicts Argentina the country and how football entertwined with social life. It probably had (and still has) a bigger effect than in the 3 countries mentioned above in that Argentina went through so many economic slumps and inflation rises that football (most notably the World Cup) was the only way of uniting the country. Quite a tale from that respect. Wilson does well to go through all the political regimes (starting with Peron) and what the state of the country (usually in a pretty bad shape) was at the time of the tournament.Since Wilson is master at analysis tactics not only on a pattern of modern time but from football's very first ventures to nowadays, he came up with 2 clear tactical schools from 2 managers: bilardisme (from Bilardo) and menotisme (from Menoti). One was defensive, the other offensive. Having been a football fan since 1998 I can honestly say that those schools keep being used in current tournament. Argentina tried being an exciting, fluent and attacking side in 2006 and 2010 only to fall at the quarter-final stage but in 2014, their defensive workrate was almost rewarded by winning the whole thing!There is another school that can't be categorized in the aforementioned two: Bielsa. Wilson does brilliantly to describe what the man is about:"For Bielsa, that was it. Saying he no longer had the 'energy' required for the job, he resigned at the end of 2004 and didn't take another job until Chile approched him in 2007. He returned to club football in 2011, first with Athletic Bilbao and then with Marseille, apparently doomed always to follow the same paradigm, spreading first bewilderment, then enlightenment and finally exhaustion. "By far and away the best quote of the book in my humble opinion but I hadn't heard of most of the rest so we can argue that it is just as good.As a criticism, this book does seem to fly the tournaments at an incredibly fast pace and could be more detailed in how bad the economy was hitting the country. Wilson also has a certain style in that he goes through big tournaments (Copa America and World Cup) very quickly, almost as if he wants to get it over with. I find myself having to reread a paragraph to find out what Argentina did to their opponent in a major tournament. Maybe it's just me though.A good read nonetheless but it's best you take an interest in football (preferably a big one) before you pick this one up. Otherwise you won't really appreciate how good it is. Impresionante reseña de la historia de nuestro fútbol. Detallada y con mucha lectura social de lo q somos. Tiene algunos errores en nombres de jugadores o resultados. Menores, pero algo molestos. A corregir en vista de una edición en español. Wilson es uno de los grandes. Awesome read, as per all his previous works well researched and entertaining narrative. UnrelentingEnjoyable interwoven narratives between the history of a nation and its football. Not as snappy as previous books by the author but rich in quality.